Pretty basic piece that looks nice at the end of my daughter's bed. 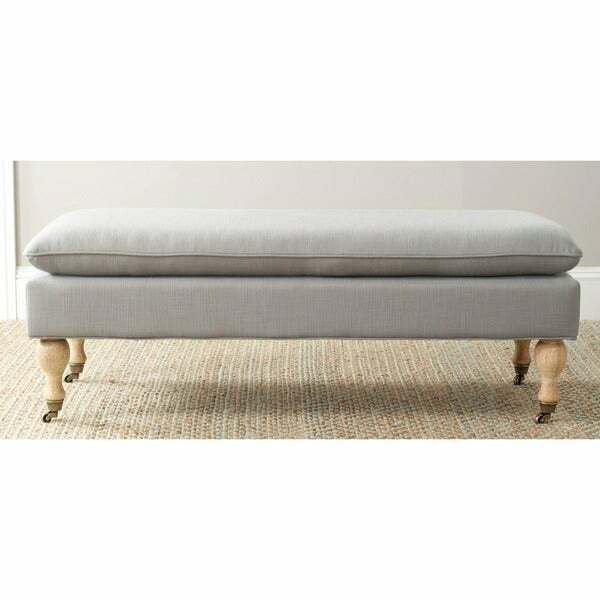 Safavieh Hampton Light Grey Cotton Blend Pillow Top Bench - 51.8" x 20.7" x 19.1"
Safavieh Hampton Cream Pillowtop Oakwood Bench - 51.8" x 20.7" x 19.1"
Safavieh Hampton Grey Cotton Blend Pillow Top Bench - 51.8" x 20.7" x 19.1"
Safavieh Hampton Taupe Cotton Pillow Top Bench - 51.8" x 20.7" x 19.1"
Our classic bench features proper turned English legs with solid brass casters and smart and neat knife edge seat cushion. All in a light grey colored cotton blend fabric and is perfect for any home at the foot of almost any bed or in front of your coffee table for extra seating. Dimensions 17.5 in. H. x 20.5 in. W. x 52 in D.
This bench is great. The color on the site appears accurate and the product definitely feels stable. The bench also feels like it is good quality and I really like the fabric. The cushion is very firm (which in my opinion is not very comfortable), but I anticipate it will feel better as it is used. Also, there are little wheels on the bottom of each leg, which is great if you want to move the bench around the room. Overall, I'm glad I purchased this product. Hall bench is just what we needed. I can always depend on Safavieh for good quality furniture. The color and quality of the bench and spot on. We remove our shoes when entering our home so this bench gets lots of use. I would recommend this bench to friends. What a lovely bench! The height, color and material is perfectly what I wanted! Thank you! I love the bench! Few things to note depending on your needs. The cushion is firm, maybe it will soften after repeated sitting. If you are looking for a bench to store tall boots under, this is not it. The height from floor to bottom of the bench is small. This is our second like kind that we bought. The bench chair accents very nicely with our bed in our guest room and brightens the room. Friendly price, as well. Product looks just like online picture. Comfortable! Pleasantly surprised...very well constructed and great looking. So happy with this purchase! "Does this have any smell like chemicals? I am very sensitive to synthetic and chemical smells. Thanks"
"Do you have to use the wheels on the legs or can the wheels be removed?" These wheels can be removed. "How light is the grey, Is it as light as it seems in the picture?" Hello OstkUser68993, we try to represent the colors of our products accurately. Unfortunately, due to the difference in monitor colors we cannot guarantee that the color will match exactly what you see on your screen. Thank you for shopping with us. "How tall are the legs on this piece, and how do they connect to the bottom of the bench?" Hello goodgraces, The legs screw into the bench. The legs are approximately 8 ½ inches tall. If you have any other questions please let us know. Have a great day!